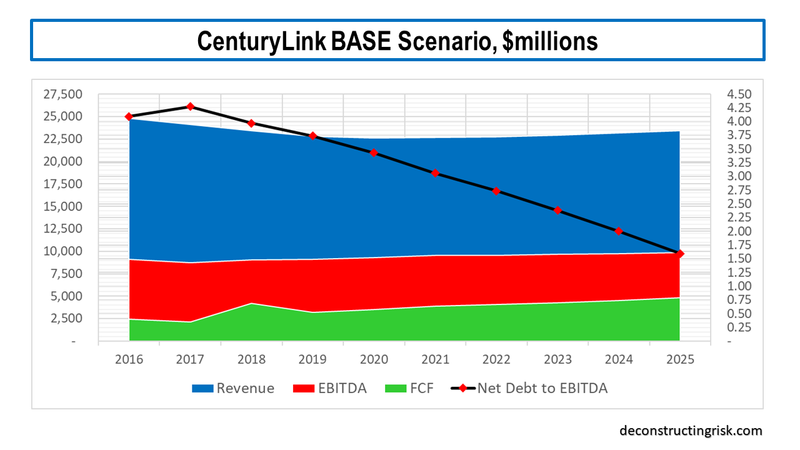 It’s been over 4 months since I made my overtly positive 2018 EBITDA call on Centurylink (CTL), as per this February post. I estimated EBITDA guidance for 2018 around $9.25 billion whereas CTL’s actual guidance was between $8.75 billion to $8.95 billion. 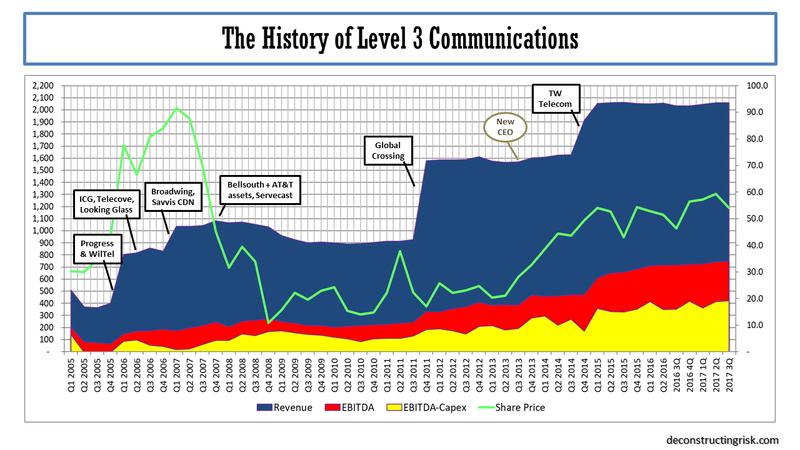 In my previous CTL post back in August 2017, the base case 2018 EBITDA was much closer to the mark at $8.95 billion! 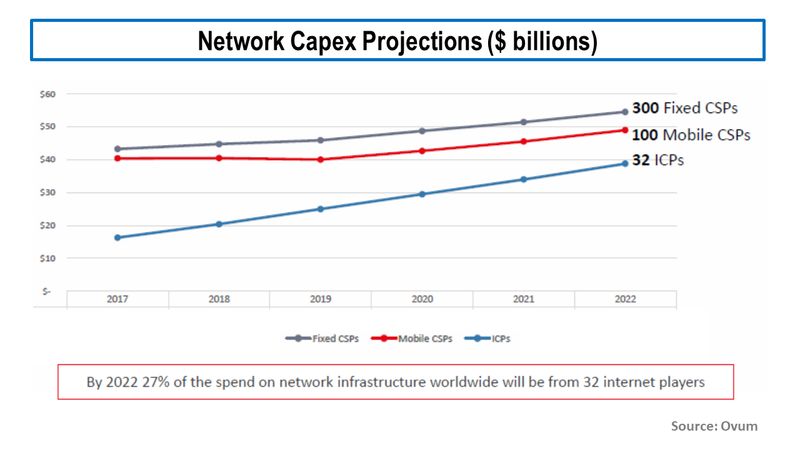 The reason for my $0.4 billion overshoot was an over optimistic reaction to the comments CFO Sunit Patel made earlier in the year on a possible 5%-7% margin improvement over the next 3 to 5 years. 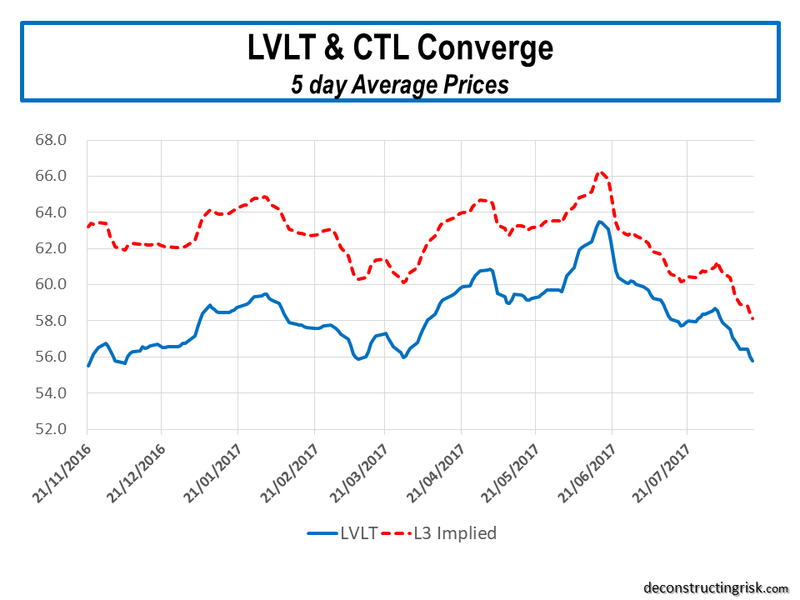 In my defense, the exhibit below comparing the cumulative margin improvement following the LVLT/TWTC merger compared to those now forecast by analysts from the CTL/LVLT merger shows how one could see more upside than indicated by guidance from the new management at CTL (i.e. the old LVLT management team after their successful reverse takeover of CTL). 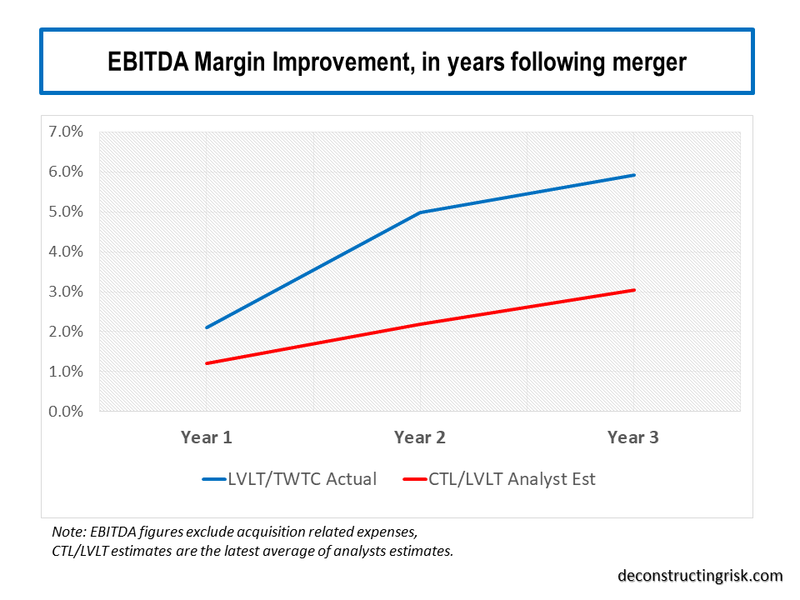 However, the LVLT/TWTC merger was a very different deal than the CTL/LVLT one. 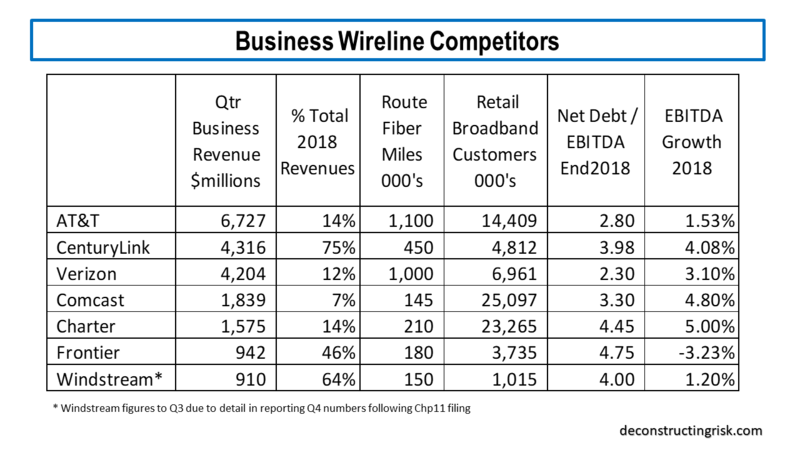 For starters, TWTC was a growing fiber based business, at both revenue and EBITDA lines, when it merged with LVLT whereas CTL is a declining one, at both revenue and EBITDA lines, with over 40% of its standalone business in legacy services. 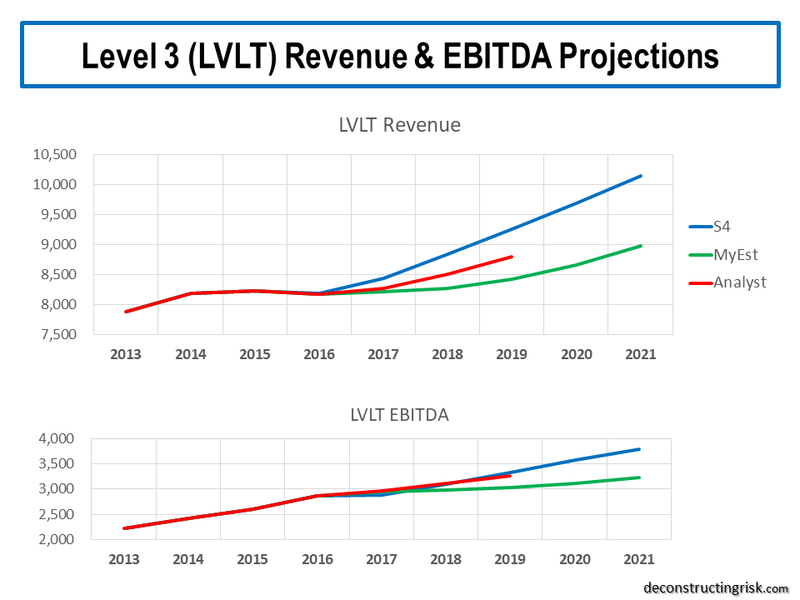 I have rebuilt my model on the combined entity and carefully considered the top and bottom line impact of the declining legacy business on the combined CTL/LVLT projections in addition to the potential cost savings compared to those articulated by CFO Sunit Patel and new CEO Jeff Storey (I am assuming $1 billion of operating synergies compared to the guided figure of $0.85 billion). 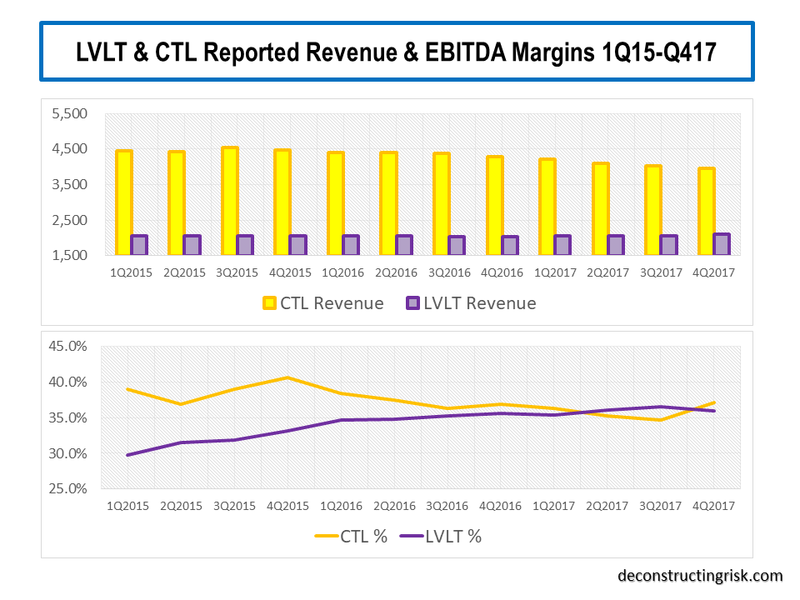 The graph below illustrates that looking at historical proforma margins on a combined business to project the future is misleading given the underlying trends at CTL, particularly the declining legacy business, and the improving margins at LVLT from the TWTC synergies. 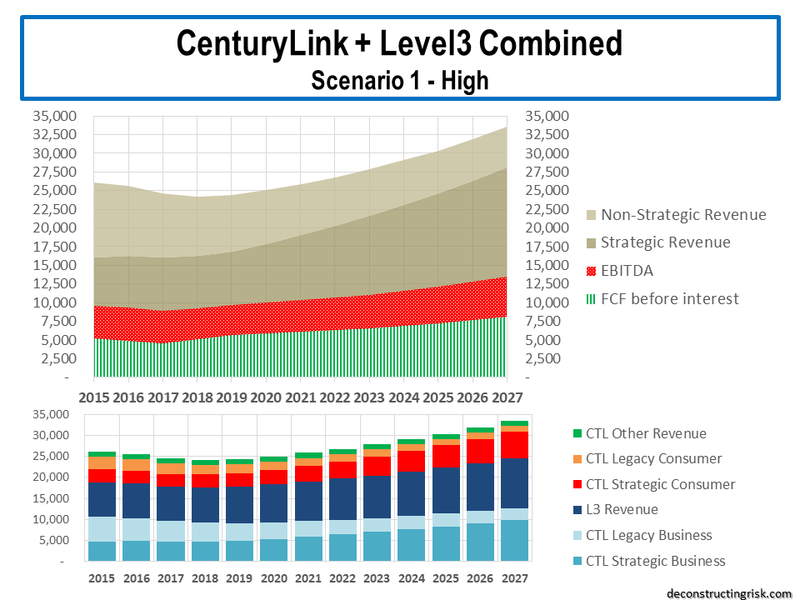 For the newly combined business, I estimate the old legacy business will make up approximately 25% of the new CTL’s revenue base. 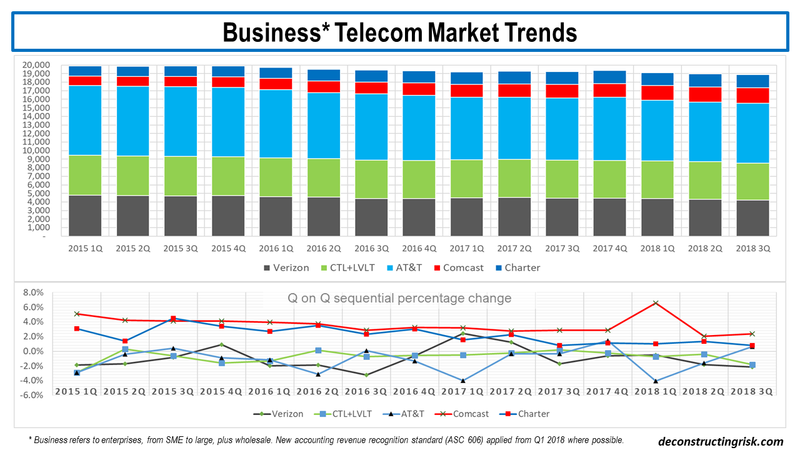 Historically, for the combined business, I estimate the legacy business (split 65:35 between the enterprise & consumer businesses) has been declining on average quarter on quarter by 2.5% over the past 6 quarters whereas the strategic (i.e. non-legacy) business has grown 0.5% on average. The strategic growth rate has been lower on average in recent quarters if Q1 2018 is excluded. 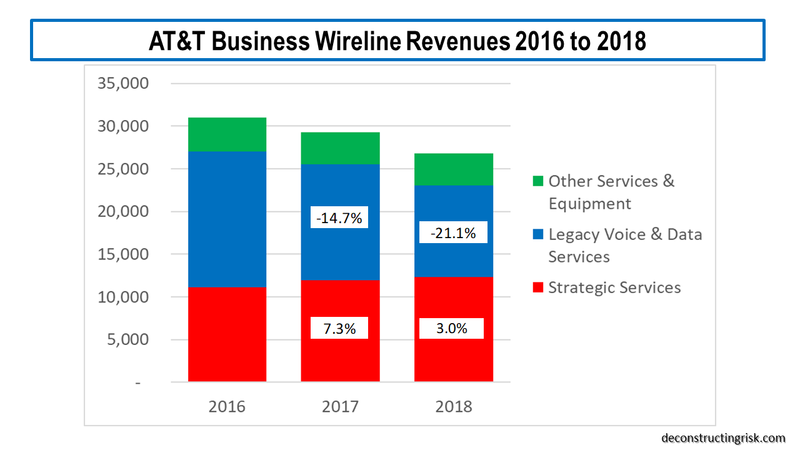 The previous quarters poor performance could be due to the uncertainty over the merger, but the performance of the key strategic business will be an important metric to watch in future quarters (unfortunately they do not split the business out this way in their reports anymore). 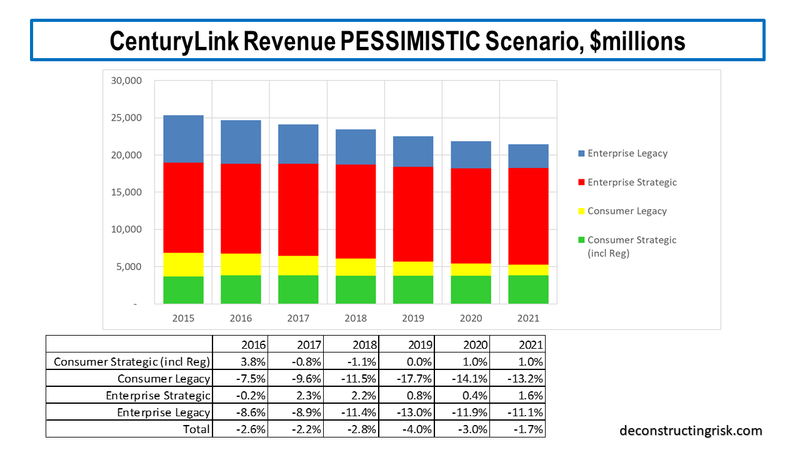 The forward quarter on quarter decline/growth rates for the legacy/strategic blocks are critical in determining future revenues and margins. 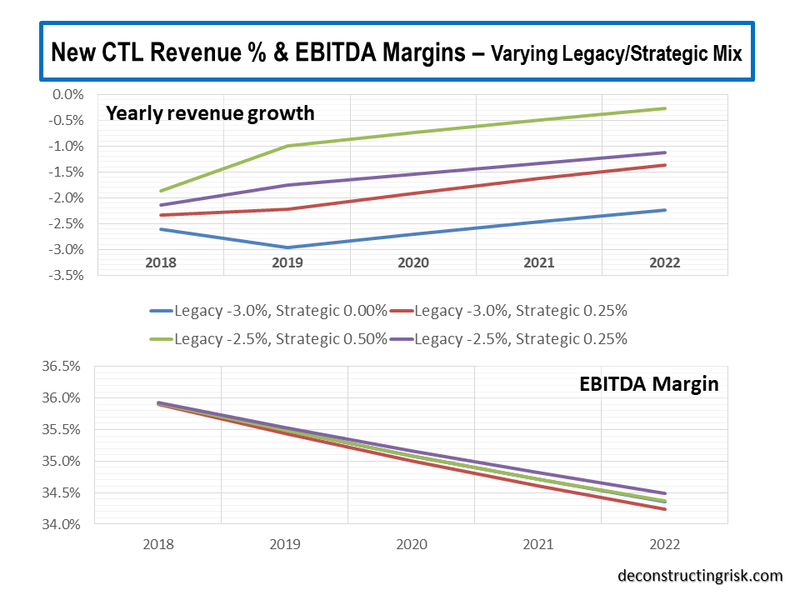 The graph below shows the different impacts on annual revenue growth and EBITDA margins for different sets of legacy and strategic quarterly declines/increases. 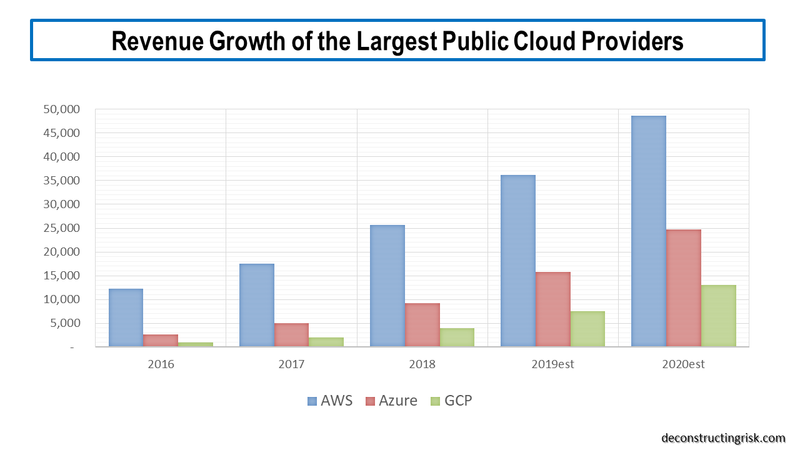 This analysis shows that the underlying business is facing the headwind of up to a 3% revenue decline in 2019 and up to 2.5% decline by 2022. 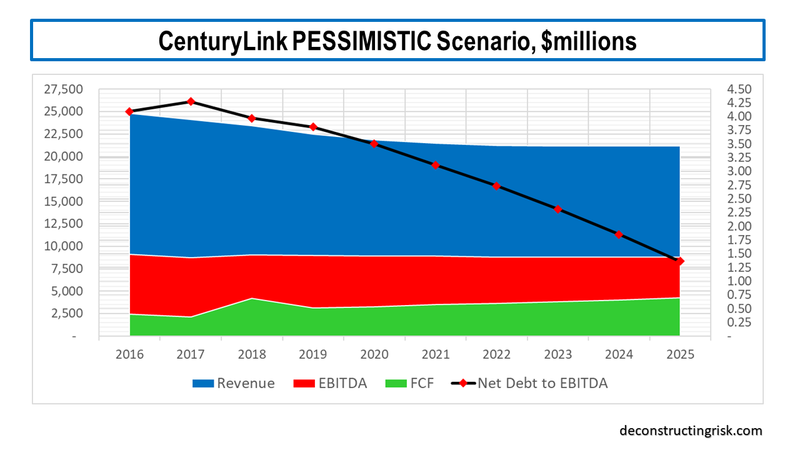 As a result, underlying EBITDA margins also could be facing an annual 40 basis point decline from 2019 through 2022. 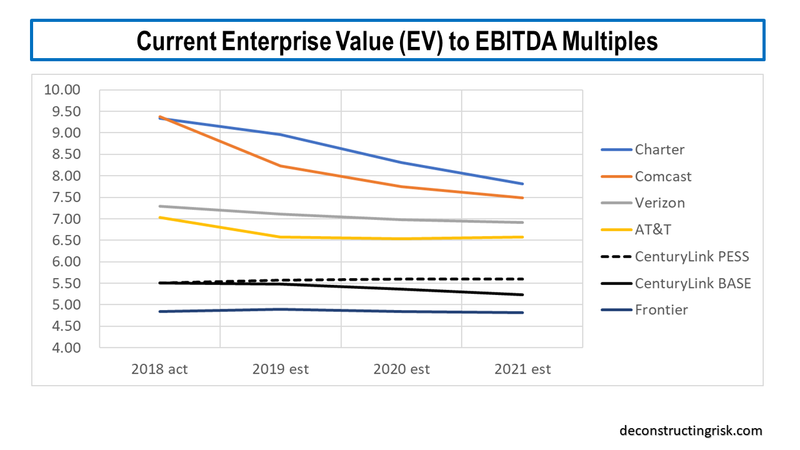 This decline in underlying EBITDA margins explains an element of the difference in cumulative EBITDA margin improvement in the first graph above. 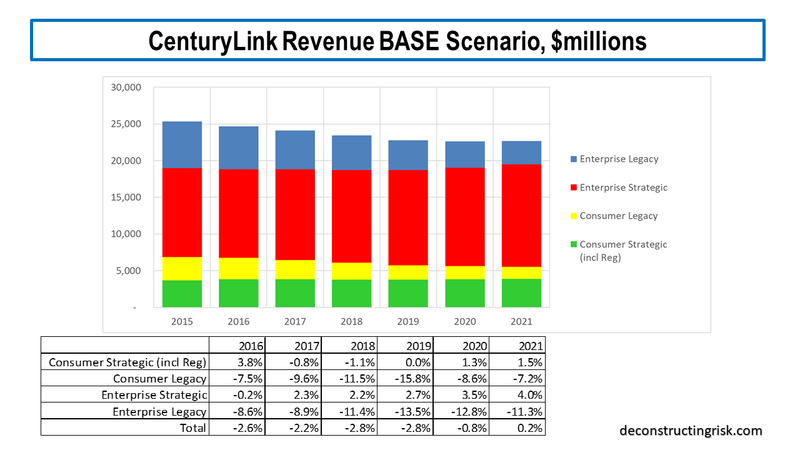 For my base scenario, I have assumed a quarterly revenue decline of 2.75% on legacy business (slightly worse that the past 6 quarter average of 2.5%) and a quarterly increase of 0.50% in strategic revenue (in line with the past 6 quarter average). 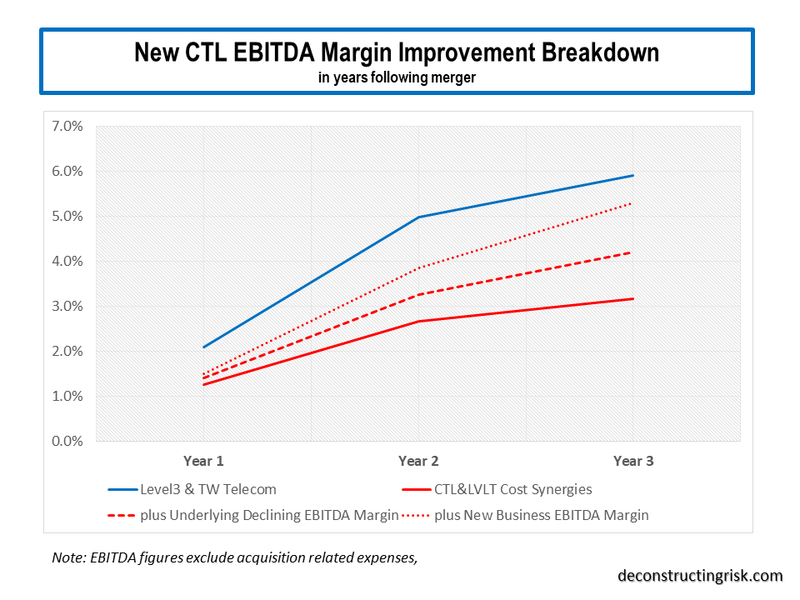 I have also included an increase in EBITDA margin due to new business that the enlarged group can attract due to its larger footprint and relevance (the revenue impact is minimal as it will likely mainly be from existing clients scaling up although the margin impact could be more significant). I have sense checked the resulting revenue figures against independent projections using the new business classifications presented by the firm. The breakdown of the different cumulative impacts in my base scenario are shown below. These figures get to just within the 5%-7% range of margin improvement articulated by Sunit Patel with 5.3% combined improvement after the 3rd year, leaving room for further margin improvement in subsequent years. 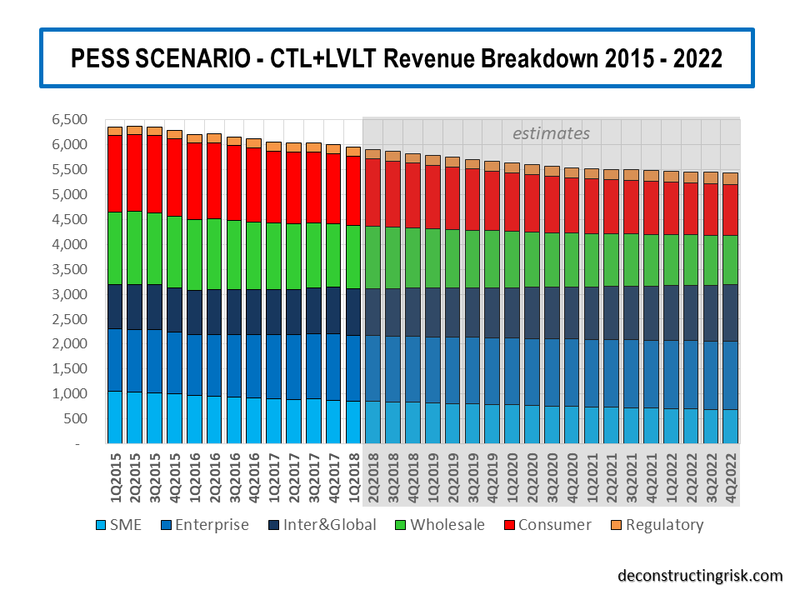 The graph below shows my base scenario revenue figures using the new classifications from CTL. This time around, I will not be considering an optimistic scenario but rather focusing on the downside to my base selections. 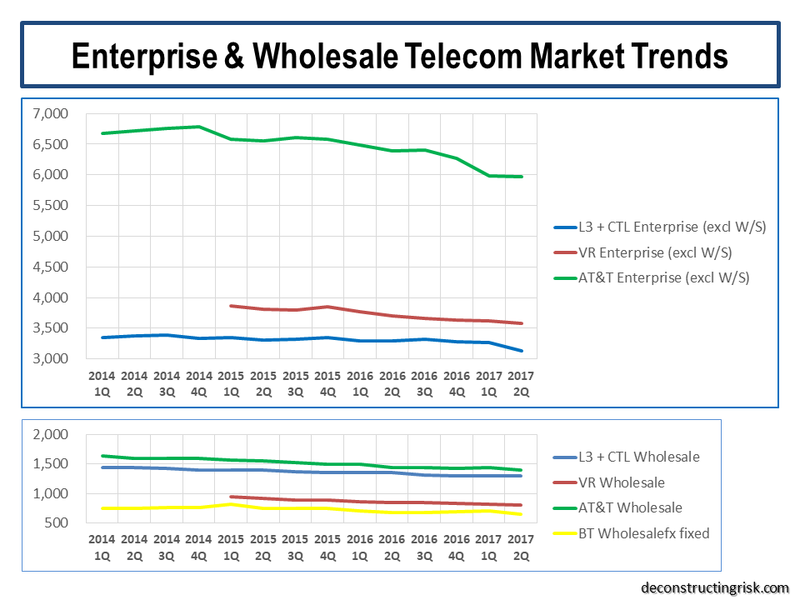 Upside to my base scenarios is possible if recent revenue trends improve, as a result say of rapid 5G deployments (see this post). 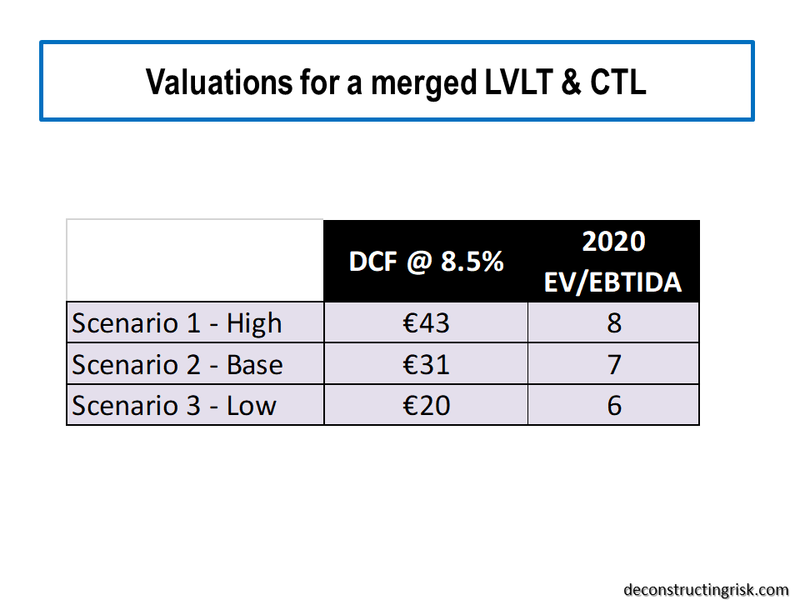 Upside could also come from CTL’s deep enterprise network being tempting to possible acquirers in a vertical M&A frenzy, although that sounds a bit like wishful thinking to my mind. 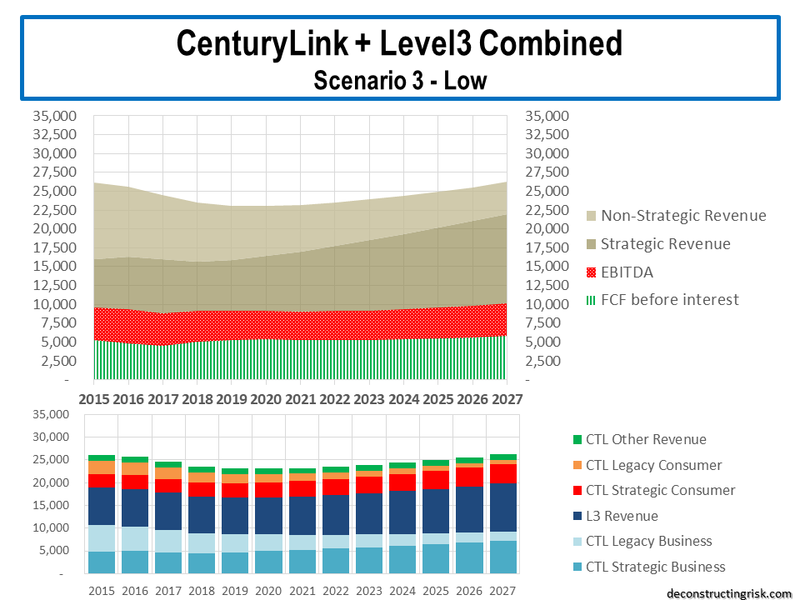 The balance of probabilities is more likely to be on the downside in terms of revenue (although I do have confidence in CTL’s management ability to manage the various levers to hit their EBITDA targets). 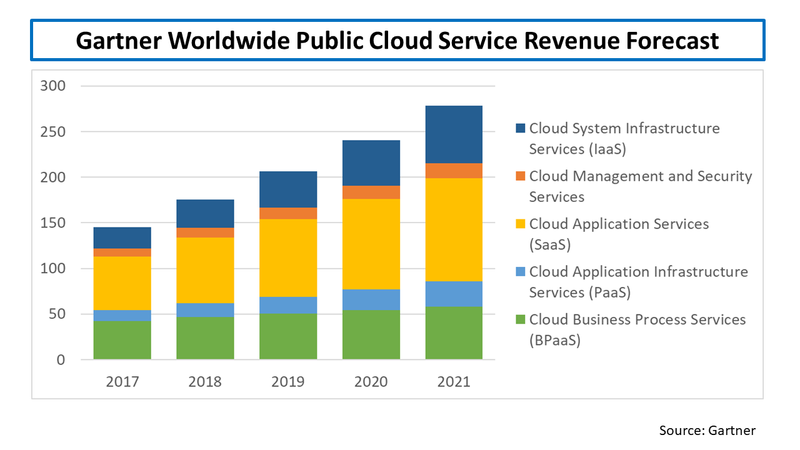 For my pessimistic selections, I have assumed an accelerated quarterly revenue decline of 3% on legacy business and a flatlining quarterly change of 0% in strategic revenue (due to pressure on the enterprise business from increased software enabled competitors). These are fairly brutal assumptions. The impact of new business, particularly its impact on margins, is also assumed to be diminished compared to my base assumptions. 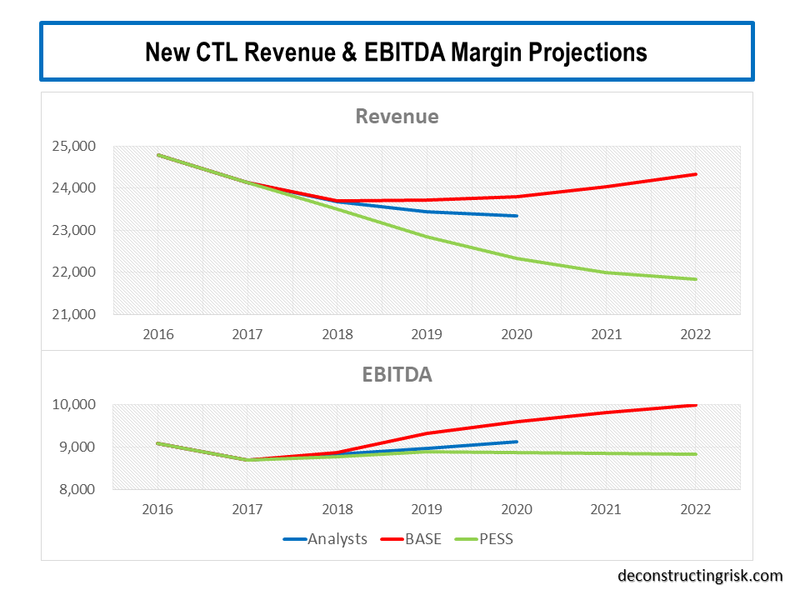 Again, I sense checked these top-line figures by projections using the new business classifications from CTL, as below. 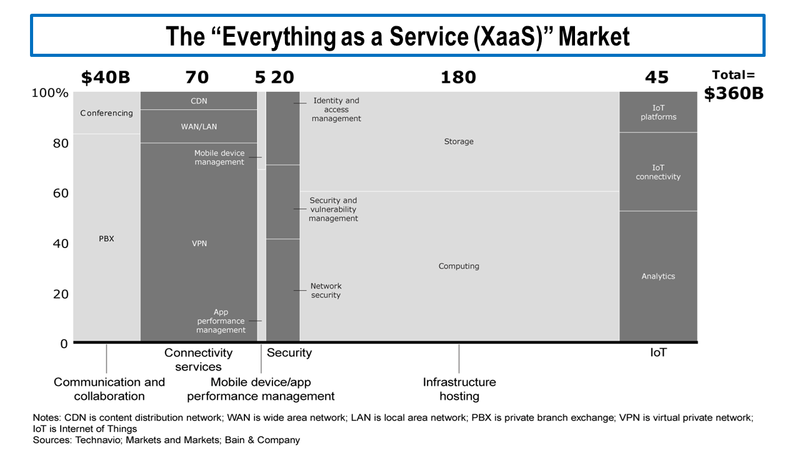 These projections clearly show a business model under significant pressure. 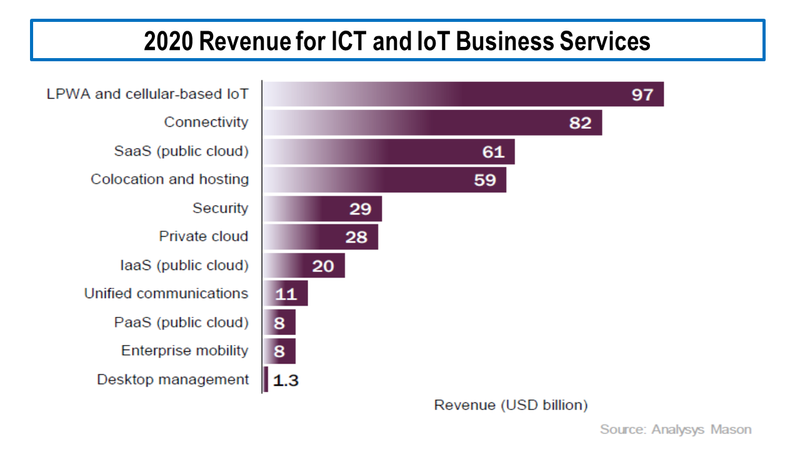 Taking all of the above factors into account, my revenue and post synergy EBITDA projections come out as per the graph below. On CTL’s debt, despite the issues surrounding LIBOR as a base rate for the floating debt (see this post), I am reasonably comfortable given approx. 65% of the debt is fixed. 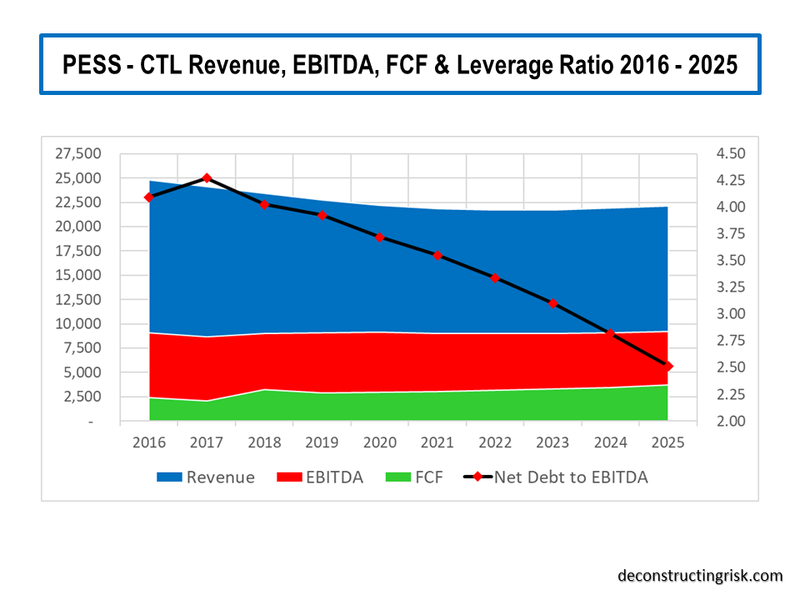 The debt load is high, at net debt to mid-point 2018 guided EBITDA of 4.2, but manageable (one area where Sunit has proven his ability is debt management!). I estimate that for every 25 basis point increase in the base floating rate (there are alternatives to LIBOR detailed in its floating credit facilities which is important given LIBOR’s likely replacement by something like SOFR, as per this article) the impact on CTL’s total debt interest rate is 8.5 basis points. 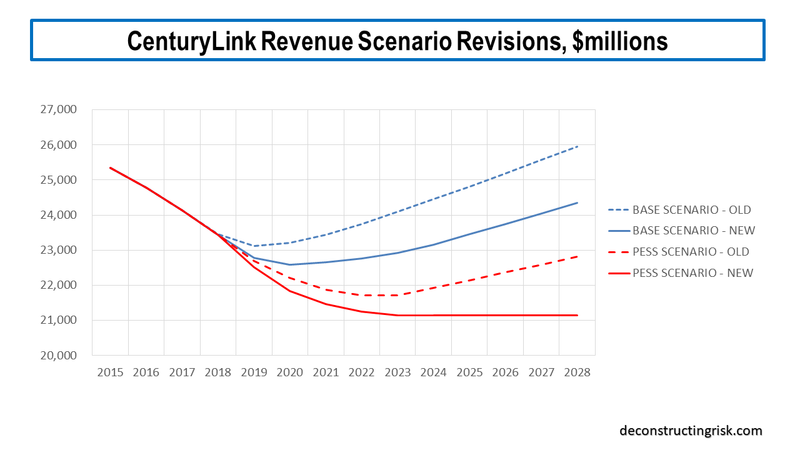 Also, any significant debt repayment is not due until 2020 which gives time to ensure operating efficiencies are delivered. 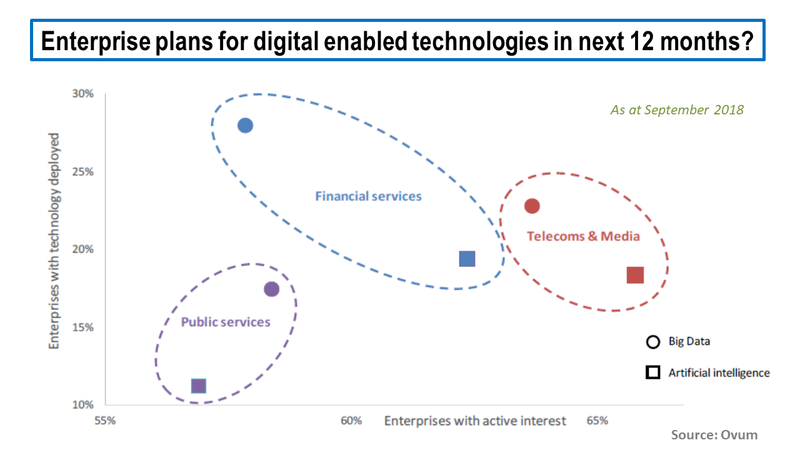 Of course, if the overall business model is in trouble despite achieving operational targets (e.g. 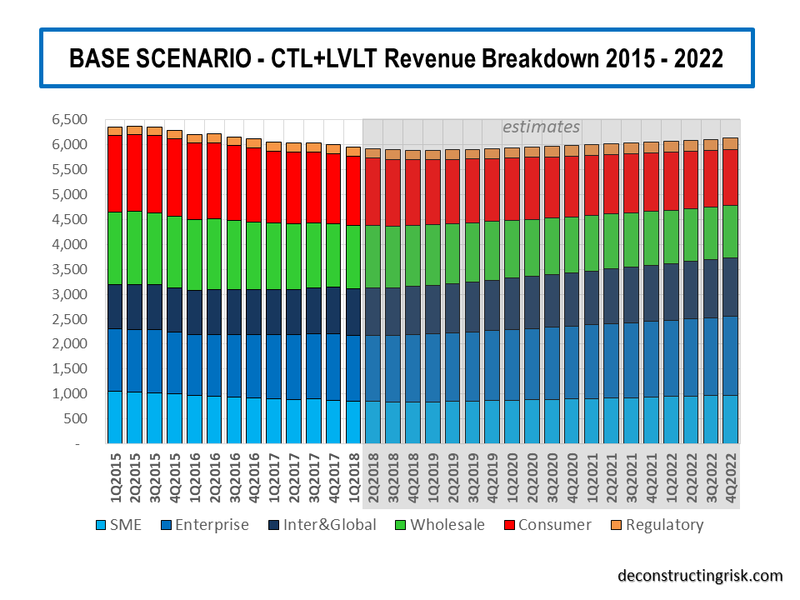 software based telecom serves disrupt CTL) as per the pessimistic scenario, the debt load will become a big issue by 2020 (I still have the scars from the telecom bust)! The key question concerning CTL in the short term is the sustainability of its dividend, given its current dividend yield of over 11.5% is amongst the highest in the S&P500. Under my base scenario, I project that the dividend is sustainable, just. 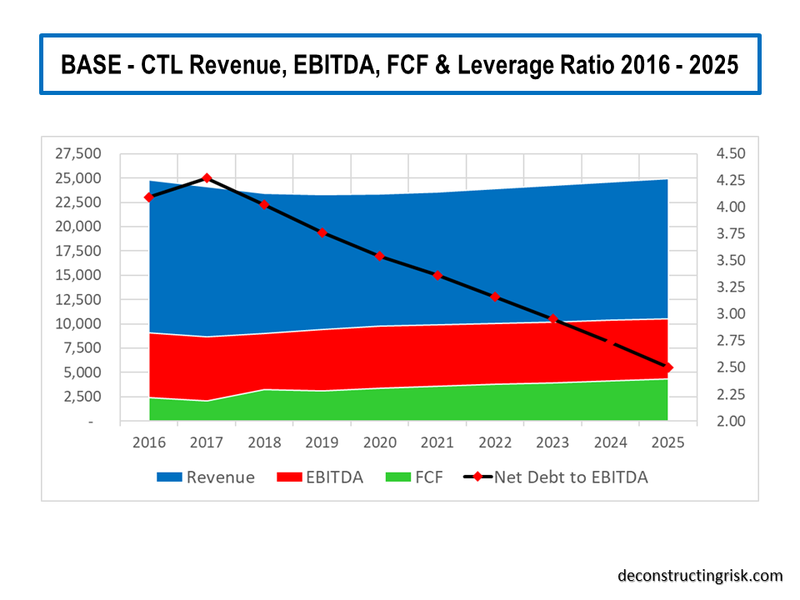 It will be tight particularly when CTL will want to be demonstrate continued progress on deleveraging year on year. Under my pessimistic scenario, I assume a 50% dividend cut in 2019 would be required. 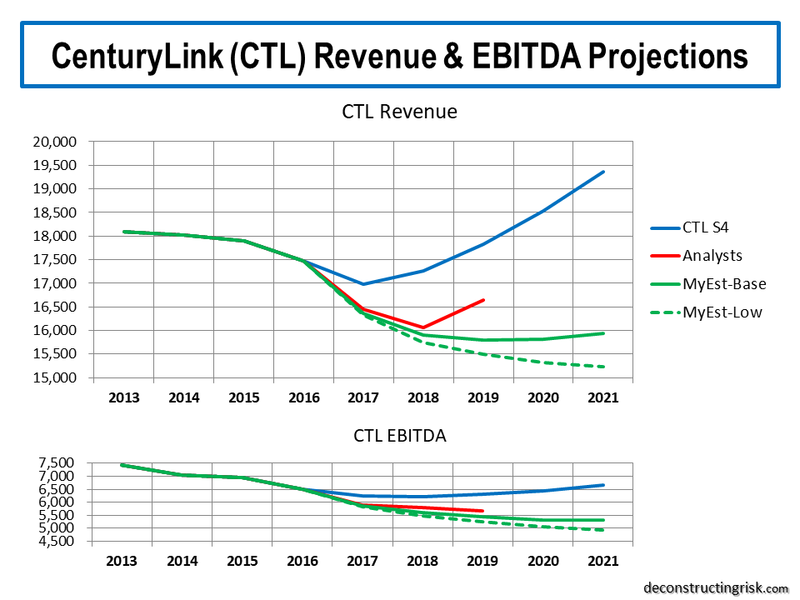 My valuation for CTL under my base and pessimistic scenarios is $18 and $10 respectively. Given the stock currently trades around $18, the market is indicating a belief in the new management team and its guidance. 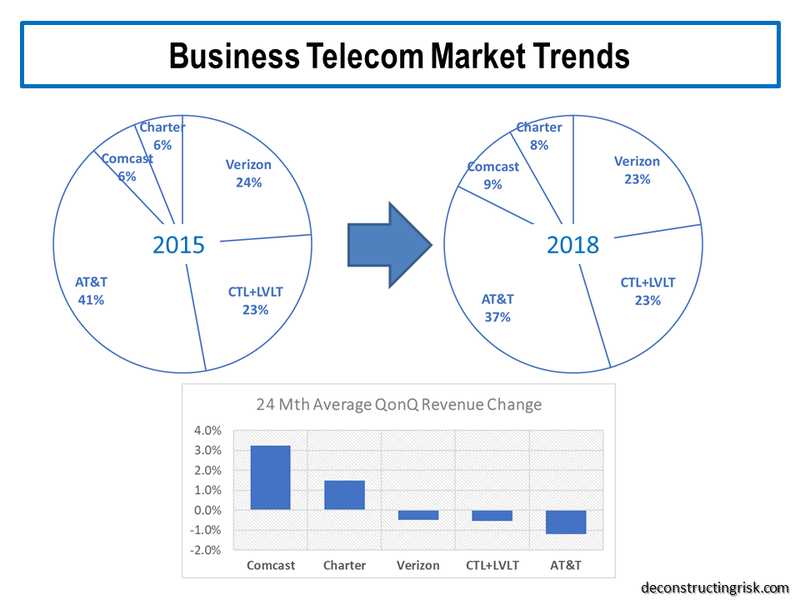 I have a high degree of confidence in current management and their ability to navigate the integration of CTL/LVLT and the challenges ahead in telecomland. However, the dividend sustainability issue will not be resolved until we see the quarterly progress over the next few quarters. Well into 2019 would be my guess. It’s also likely that markets will be increasingly volatile over the next 12 months (eh, the market seems to be waking up to the folly of Mr Trump’s trade war this morning). Highly indebted firms will likely be battered as we get deeper into a tighter monetary environment, particularly those without topline growth. Any dividend cut will hit the stock heavily. I would not be surprised if the stock fell as low as $6 following a 50% cut. Given the juicy dividend yield will provide the cashflow, buying options seem a sensible means of protecting against such a downside. Ultimately, I have high hopes for CTL but this one is not for the faint hearted. It’s a risky stock, as the dividend yield implies, in an increasingly unbalanced market and it has to execute flawlessly over the coming quarters to justify the risk.